It's time for 2010 Holiday Card Mini-Sessions! Mini-sessions are casual 45 minute portrait sessions that take place in an Atlanta park. They are the perfect opportunity to update your family photos and get some great shots for your 2010 cards. The session fee includes 25 holiday cards (5x7 cards with envelopes). Sessions will be held in the afternoon on October 17 and November 7 at Piedmont Park. Mini-sessions are $100. The fee includes your 45 minute session, online proofing gallery and 25 flat 5x7 cards professionally printed on high quality cardstock, customized with your photos and personalized greeting. Availability is limited. 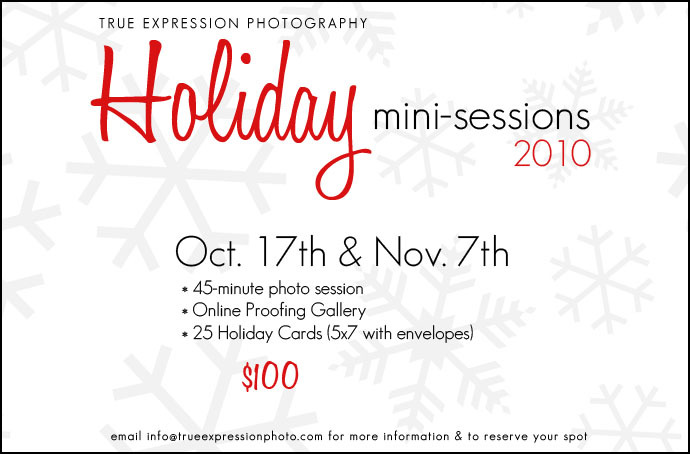 Email info@trueexpressionphoto.com for more details & to reserve a time slot! If I have already photographed you this year, 2010 holiday cards can be purchased with the photos from your wedding, engagement photos or portrait session. Contact me for details!